Morticia Addams started out as a character in Charles Addams's New Yorker cartoons. While developing the television sitcom in the 1960s, Addams named her Morticia, after the latin word for death. According to Charles Addams, she is the "real head of the family." It's hard to disagree. Morticia usually wears a black dress with a long hobble skirt, wrist-length black sleeves and a deep V neckline. 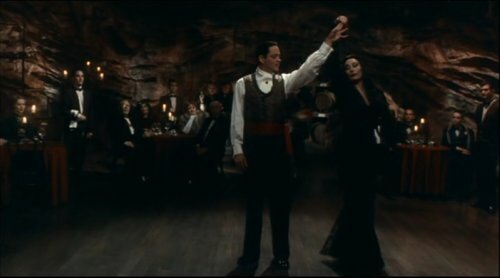 In the 1960s television series, Morticia's skirt had tendrils extending beyond the bottom of the skirt; in the 1990s movies, her dresses often had elaborate black lace and/or black beading. Her hands are almost always adorned by large rings, usually ones with silver metal and dark jewels. Her nails are long, acrylic and dark red. Morticia wears her hair raven black, long, and loose, free of any bun, braid or other encumbrance. Her makeup, of course, accentuates her pale skin. She wears blood-red, matte lipstick and has a very dramatic smokey eye look. Her eyebrows are also drawn on with black pencil (and perhaps greasepaint) in an exaggerated arch, making her look perpetually surprised and amused. 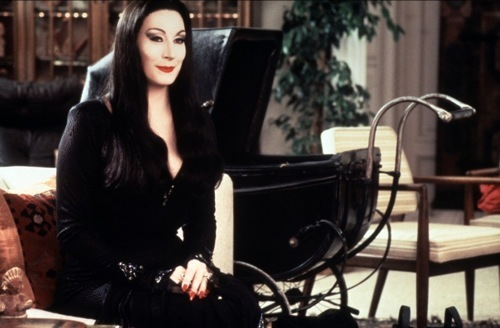 Unlike her daughter's look, Morticia Addams's is not low-maintenance––but, with practice, it is achievable. The hardest part of this outfit is getting the eye makeup right. Get it wrong, and you look like a 14-year-old emo kid, or worse; get it right, in the wrong environment, and you look like you dressed up for Halloween on the wrong day. However, I have found a few tutorials to help you learn this look. If you're looking for Morticia's dress, do yourself a favor and skip the Halloween costume stores. Morticia would never be seen in something so cheaply made and undignified. If you're strapped for cash, look for a black hobble skirt and combine it with a v-neck black shirt with long sleeves.